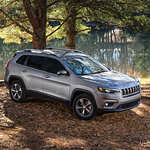 Whether you need a capable compact SUV for weekend off-road adventures or to transport your family in Honesdale, let B & B Chrysler Dodge Jeep Ram show you your various options for a 2019 Jeep Cherokee. This vehicle is all-weather ready and has a capable 4x4 system that will let you maintain traction under difficult conditions. The 2.4L Tigershark MultiAir 2 engine functions with a high level of efficiency, or you could upgrade to a 3.2L Pentastar V6 engine with a 2.0L Turbo that will provide a large power boost. When you drive, you'll be able to select between Auto, Sport, Snow, Sand/Mud, and Rock modes depending on where you are. To make towing easy, the Jeep Cherokee has a 4,500-towing capacity and comes standard with Trailer Sway Damping. With independent front and rear suspensions, you'll be able to have fun driving when you're on road as well.